...that Kirk-018 is a SPARTAN-II who was crippled during his augmentations? ...that the Plasma Rifle in Halo 3 has the same rate-of-fire and damage-per-hit as the Brute Plasma Rifle in Halo 2? This article is about the intelligence branch of the UNSC. For the Halo 3: ODST track, see The Office of Naval Intelligence (music). 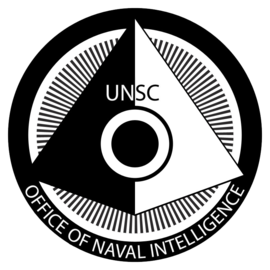 The Office of Naval Intelligence (ONI, commonly pronounced phonetically as /oʊni/) is the intelligence service of the UNSC Navy. Overtly, the agency is merely the information gathering and analysis division of the UNSC Naval Command. In reality, the operations of the Office of Naval Intelligence are far broader than simple intelligence gathering. ONI has become known for their preeminent role in the acquisition and leveraging of military intelligence. The agency is widely known for using subterfuge, deception, and manipulation in defense of humanity in order to accomplish its goals. 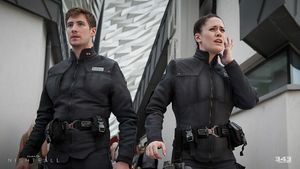 Additionally, the Office of Naval Intelligence employs numerous special projects, such as the SPARTAN programs, Project: MJOLNIR, and the investigation of Forerunner sites—the most notable of which is Trevelyan. Macer: "I know better than to trust you." Locke: "We wouldn't be doing our job if people trusted us." — Jameson Locke and Talitha Macer discuss the nature of ONI. LTJG Mason Hundley and LT Jordan Gaines on their mission in Sedra City. The Office of Naval Intelligence is responsible for UNSC signals intelligence (SIGINT), human intelligence (HUMINT), counter-espionage, propaganda, and top-secret research and development programs. The agency mostly operates independently of other UNSC branches, and at times it contravenes the law and UNSC protocol to complete top-secret missions. ONI's Commander-in-Chief (CINCONI), is Admiral Serin Osman, successor and protegé to Margaret Parangosky. As it is responsible for intelligence matters across the UNSC, ONI employs members of other military branches, and even civilians, to complete the division's shadowy work. Many of its functions and subdivisions, like the Beta-5 Division and the SPARTAN-II and SPARTAN-III programs, are enigmatic, and its personnel are regarded as mysteries by mainstream naval officers. ONI is technically subordinate to the UNSC Naval Command. In practice, however, ONI's activities extend far beyond intelligence gathering, and often receives mandates and directives from HIGHCOM itself. It is also not unheard of for ONI to operate without HIGHCOM's knowledge or official authorization, as was the case with Kilo-Five's mission; indeed, CINCONI is often considered to hold significant power within the UNSC and even the Unified Earth Government as a whole. All other competing intelligence services have been snuffed out long ago to ensure ONI's supremacy; according to the ONI AI Black-Box, "...there are no rival agencies. We castrated them all. Left them cowering in our shadow". ONI has an unusually large amount of military equipment for an intelligence service, and has a strong fleet presence. For example, ONI maintains joint control of the Navy's postwar flagship, UNSC Infinity, and holds considerable sway over her crew. ONI also maintains the UNSC's prowler fleet, a major source of Covenant deployment intelligence, under the auspices of the UNSC Prowler Corps. The Office of Naval Intelligence possesses a stealth cruiser, UNSC Point of No Return, which is used as a command vessel and a secure conference location. ONI also manages field intelligence with units such as ONI Recon 111 liaising with mainstream UNSC military units. ONI exerts virtually complete control over the flow of information across the territories under UEG control. Over the course of humanity's colonial era, a number of scattered alien artifacts built by a long-vanished civilization later to be known as the Forerunners were discovered. ONI secretly concealed all of these findings and maintained a monopoly on xenoarchaeological research into them; any civilian scientists studying the artifacts would be drafted by ONI. In order to prevent information from leaking to the public, ONI is capable of initiating system-wide data purges which erase all information on a given subject. A noted example of this is Onyx, originally surveyed as an ideal world for human settlement but erased from all UEG databases by ONI due to the alien technology discovered there. "Is ONI one happy family? Oh, please. We've got four divisions, officially, and only one of them knows that we've actually got more than that. There's Section Two—made up of psyops and PR, who each kid themselves they're not like the other at all—which tells the lies; Section Zero, which thinks it spies on everyone else, tells lies to Section Two, and thinks it tells lies to Sections One and Three; Section One does stuff we can almost talk about, the interface with other branches; and Section Three does the stuff we can't talk about or else it would have to kill everyone in fascinating and groundbreaking new ways. Technically, you're not a numbered section at all. You're the praetorian guard for CINCONI, in a way, and we just call CINCONI's staff Core Four, although it's actually in Core Five of Bravo-6, and DCS reports directly to it. You'll note I didn't mention HIGHCOM, and that's because all ONI sections lie to HIGHCOM and tell it that it's the most powerful body on Earth, which generally works well at keeping the old buffers convinced that they make the decisions. Now, are you confused? I certainly hope so, because that's my mission." Section Zero is ONI's Internal Affairs department, charged with rooting out and eliminating illegal programs. Section Zero is very discreet in its work; the true nature and activities of the division are highly classified and unknown outside the ONI command hierarchy. However, it appears that the other sections of ONI know Section Zero exists and while they are successful at deceiving Section Two, Sections One and Three are not as easily lied to and all three other sections are not easily spied on. Section One is the proper intelligence-gathering branch of ONI. As such, the section's services are most often utilized by UNSC forces. Its responsibilities include information gathering and codebreaking though military espionage. Information released by Section One includes evacuation notices for colony worlds and Covenant force deployments. Section One was responsible for covering up all information on locations ONI wishes to keep hidden from the public eye, such as Onyx. Benjamin Giraud works with Section Two to make battlefield imagery appear less grotesque. Section Two is the propaganda branch of ONI; they are also responsible for psychological operations. Overtly, however, Section Two only deals with external communication and public morale. It handles communication between colonies to reduce the spread of rumors and information that would damage morale. It was responsible for releasing details of the SPARTAN-II program to the public to boost morale throughout UEG territory. Once information about the Spartans was released to the public, Section Two had to maintain the Spartans' near-mythical status within the military by listing those killed in action as MIA. It was believed that news of Spartan deaths would cripple the UNSC's already-flagging morale. Section Two is also responsible for broadcasting pre-recorded human carrier signals from various locations into slipspace to confuse Covenant triangulation technology, preventing them from discovering Earth. Section Three is the top-secret projects division of ONI that oversees the various groups responsible for creating new innovations through the use of advanced alien technology. It is responsible for the SPARTAN-II and SPARTAN-III programs and many other black operations. Though a few of Section Three's programs are well-known and are widely celebrated for their success, the UNSC Marine Corps and top brass of the UNSC treat most with contempt. This is especially true of the Spartans, who are regarded as "freaks" by some humans. Though its overall purpose is unknown, Section Three's Beta-3 Division is known to analyze captured Covenant technology such as the Kig-Yar point defense gauntlet. In addition to performing black operations, Section Three's Beta-5 Division operates the SPARTAN-III program, which is kept secret from the majority of Section Three. This compartmentalization is designed to ensure secrecy and security. The Delta-6 Division has oversight of an unknown number of SPARTAN-IVs in stealth operations, including counterinsurgency missions. Materials Group is subgroup of Section Three, which is responsible for the development of advanced matériel. The group's most significant development is the Spartans' MJOLNIR Powered Assault Armor, as well as the prototype exoskeletons which preceded it. The Materials Group's HRUNTING team revived the exoskeleton project, leading to the development of the Mark III [B] Cyclops. Later, the team merged with the YGGDRASIL project to create the Mark I prototype and Mark IX "Mantis" armor defense systems. Other developments include the XRP12 Gremlin and its X23 EMP cannon; the Zeus-class plasma cannon; and the planet-destroying NOVA bomb. Watershed Division is one of such branches of ONI. During the war, the Watershed Division produced over 2,000 units of the Semi-Powered Infiltration armor, issued to the Spartan-IIIs. In post-war period it developed an upgrades for the first generation of MJOLNIR armor and a number of MJOLNIR [GEN2] armor variants issued to a very short list of people with high levels of clearance to use such rare equipment. Tip of the Shadow: Tip of the Shadow is a sub-division of Section 3 dedicated with the recovery, analyzing, and decoding, of data that Section 3 is stuck with. In addition to the primary numbered sections, there are also a number of lesser-known or "theoretical" subdivisions within ONI. 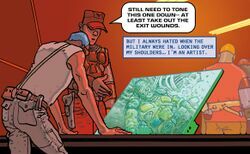 A major decision-making body of three key individuals within ONI, conferring during major crises such as the onset of the Covenant War. The Signal Corps is tasked with broadcasting radio signals in order to confuse Covenant fleet and troop movements, diverting attention from UEG colonies that are evacuating. The Prowler Corps oversees the deployment of prowlers and their electronic intelligence gathering. A former branch of the Colonial Administration Authority, the DCS was absorbed into ONI sometime after Margaret Parangosky achieved the rank of Captain the following the CAA's assimilation into the UNSC. The DCS operates intelligence-gathering agents within the colonies, and reports directly to CINCONI. The Reverse Engineering and Prototyping–Xenotechnology department is tasked with developing advanced technologies from alien sources, both Covenant and Forerunner. They receive unlimited funding and resources and are unknown outside the Office of Naval Intelligence. The department was formed from many smaller groups created during the Human-Covenant War. Like the Materials Group, it helped disseminate new weapons and shield technologies to UNSC forces as the war neared its end by way of firms such as Misriah Armory. Their activities include weapon development, technology research and analysis, reapplication of alien technology, vehicle development, and research into hard light technology. The REAP-X department's greatest breakthrough was the discovery of a working Forerunner slipspace drive used to complete the UNSC Infinity, the post-war flagship of the UNSC Navy. The department utilizes many variants of standard military vehicles modified for special missions. The main security force of the Office of Naval Intelligence, with personnel generally recruited from UNSC Army and Marine candidates. A detachment of ONI Security was stationed on Ivanoff Station when it was attacked by the Didact. Members of Kilo-Five prepairing for the next mission. ONI Assembly Team 56: An ONI construction team responsible for the construction of Ivanoff Station. The agency's insignia has many layers of meaning: superficially it is a stylized surveillance satellite, but it also represents a pyramid of knowledge with an all-seeing eye and an arrowhead directed to the heavens. ONI personnel, especially officers, are often referred to as "spooks". Many ONI agents enjoy significant latitude in the discharge of their duties, often violating legal and moral boundaries or acquiring vast amounts of UNSC resources to achieve their ends. Intra-ONI dynamics are often strained with intense competition amongst its own personnel. Agents operate under heavy scrutiny, with mistakes often leading to demotion or termination of employment. ONI provides field manuals on a number of topics for use with its personnel. Field Operations Guide FM 90-10-140: This field guide has information on ODST and the systems and weaponry they use. Argent Moon - ONI research and development station. Ivanoff Station, an asteroid-based research facility near Installation 03. Many Office of Naval Intelligence facilities employ a very distinct style of architecture and design, which reflects the organization's role and field of work. Whereas the typical UNSC aesthetic favors a militaristic and utilitarian approach, ONI's structures are often monumental and imposing, covered in angular surfaces and sharp edges, resulting in an overall impression similar to a stealth aircraft, a motif also present in the ONI's prowlers. The angled exteriors are contrasted by crisp, sterile interior spaces with cold-toned lighting and chiefly white surfaces as well as heavy use of glass and steel in larger spaces such as atriums. Examples of such architecture can be found in ONI's SWORD Base, shaped like an upward-pointing wedge covered in metallic plating, the needle-like Olympic Tower, as well as the enormous, cube-shaped ONI Alpha Site in New Mombasa. In reality, the Office of Naval Intelligence is an agency of the United States Navy that was established in 1882. ONI's motto, "Semper Vigilans", is also the motto of the United States Civil Air Patrol. The phrase is Latin for "Always vigilant." Halo: The Fall of Reach refers to ONI as the UNSC Military Intelligence Division. This name has never been mentioned in subsequent media, though the reference remains in the 2010 re-release of the book. Presumably, this is a production mistake rather than an alternate in-universe name; ONI had not yet been firmly integrated within canon so the Military Intelligence Division may have been a real-world working title for the group. ONI's pre-Halo 3: ODST insignia features the all-seeing eye, a nod to ONI's line of work. The current symbol may also be interpreted as a stylized depiction of the eye motif. Oni is the name of a Bungie third-person action game which predates Halo: Combat Evolved. The game in turn is named for an ogre-like creature from Japanese mythology. An official Halo Waypoint forum user known as Catalog (posing as the entity of the same name) refers to the Office of Naval Intelligence as "[frumentarii]". The frumentarii were the secret service of the Roman Empire, reflecting ONI's position within the UNSC. Catalog also notes that it has infiltrated ONI data cores on several occasions. ↑ Halo: Evolutions — "From the Office of Dr. William Arthur Iqbal"
↑ Halo: Evolutions, "The Mona Lisa"